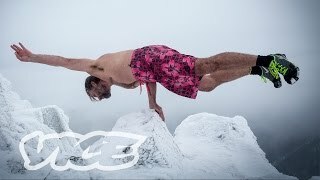 Wim Hof (born 20 April 1959) is a Dutch daredevil, commonly nicknamed The Iceman for his ability to withstand extreme cold, which he attributes to exposure to cold, meditation and breathing techniques (similar to the Tibetan technique Tummo). Wim Hof has set out to spread the potential health benefits of his breathing techniques, working closely with scientists around the world to prove that his techniques work. Wim Hof first caught the attention of scientists when he proved he was able to use meditation to stay submerged in ice for 1 hour and 53 minutes without his core body temperature changing. Since then, he’s climbed Mount Everest in his shorts, resisted altitude sickness, completed a marathon in the Namib Desert with no water and proven under a laboratory setting that he’s able to influence his autonomic nervous system and immune system at will. <br> Almost everything Wim has done was previously thought to be impossible - but he’s not a freak of nature. <br> To demonstrate that any human can learn his methods, Wim offered to teach Matt Shea and Daisy-May Hudson to climb a freezing cold mountain in their shorts without getting cold. But when Matt and Daisy signed up for the training, they had no idea that the so-called Iceman was planning to lead them on a psychedelic journey across Europe that circled the chasm between science, spirituality and mystery. The breathing exercise has a profound effect and should be practiced in the way it is explained. Always do the breathing exercise in a safe environment (e.g. sitting on a couch/floor) and unforced. <br> Never practice the exercises before or during diving, driving, swimming, taking a bath or in any other environment/place where, should you pass out, a serious injury could occur. Wim Hof breathing may cause tingling sensations and/or lightheadedness. If you’ve fainted, it means that you went to far. Take a step back next time. <br> The cold is a powerful force. We strongly advise to gradually build up exposing yourself to the cold. Always train without force and listen to your body carefully. If it is not practiced responsible, there is a risk of hypothermia. <br> Do not practice the method during pregnancy or when having epilepsy. Persons with cardiovascular health issues, or any other (serious) health conditions, should always consult a medical doctor before starting with the Wim Hof Method.